I love the holidays because it gives me the perfect excuse to make all my favorite dishes. I enjoy serving Individual Beef Wellingtons, a dish I teach in one of my classes. I also like Salmon Wellington, Salmon Roulade and Herb Crusted Prime Rib Roast, also known as a Standing Rib Roast. 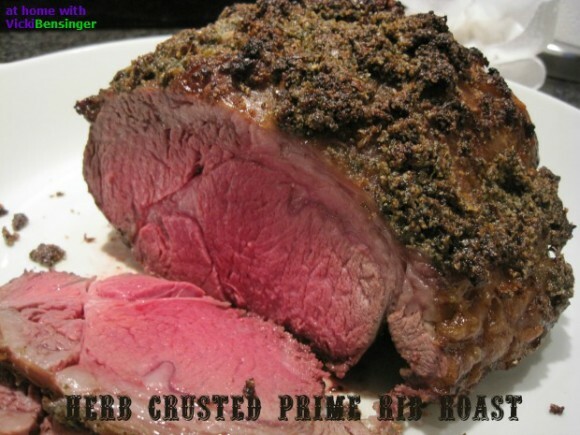 Of all these dishes the Herb Crusted Prime Rib Roast is by far the easiest to prepare and tastes sensational. I posted the recipe here on At Home with Vicki Bensinger last year. Since that time I’ve received numerous emails asking me specific questions on roasting, and if I make it with the bone in or boneless. So I decided with the holidays just a week away, I would create a video showing this easy technique, that creates a perfect prime rib every time. Please watch the video below. For the written recipe, click here……. Be sure to stop by later this week as I share more festive holiday dishes! Talk about the perfect roast, Vicki. Thanks for the video too. Thanks Angie, I hope you’ll try this easy technique for making the perfect prime rib roast. Wonderful video, Vicki, and yes, your roast turned out perfect! I’ve read about this method but have been too afraid to try it for company but now feel confident that I can do it based on your video instructions. You should try it, it’s so easy and foolproof! Yes it definitely gets hectic but it’s fun. I find myself popping Cold Snap with everyone so sick all over, grocery stores, the malls. Lots of hand cleaner in my car too. You can never be too careful during the holidays. As much as I love greeting everyone at my parties or when going to one with a kiss, I’m always cautious that someone will be sick! Anyway, I hope you’ll try this simple and delicious recipe. It satisfies everyone all the time. You’ve never tried it? If you like very tender roast beef you’ll love this. You cut it thick and eat it like a steak. It’s so incredibly moist and so good. This recipe is as easy as they come and always produces stellar results. I hope you’ll give it a try. Great looking roast & video! I haven’t made one of these for years and years. Gotta do it again sometime – Straub’s has great ones at the moment. I actually got this at Whole Foods but next week they’re selling it for $11.99 lb. which is a steal. It was really tasty and tender. That is one perfect looking roast. My poor hubby always orders it when we eat out, I don’t make it at home. Have to take tips from you to make it sometime at home. How I wish I could eat your wellingtons, those lucky students. Oh you should surprise him with this for the holidays. It’s so simple. Honestly if you follow my directions it will be perfect. Call me if you have any issues, I’d be happy to walk you through it. As for my wellingtons, they are wonderful! Wish you lived close by so I could give you a class. So am I. I’m glad you enjoyed it, and I hope you’ll try it. Your prime rib looks extraordinary! I am thinking of beef wellington this year…doing a whole one, but will have to check out your individual version. Is your recipe on your blog yet? Hi Liz, I’m so sorry I’m just getting back to you. I do not have that recipe posted since it’s one of my popular classes. Typically I don’t share the recipe that I teach on my blog. I hope your dish turned out perfect for the holidays. This recipe makes a flawless prime rib. After you try the recipe I hope you’ll share with me how it turned out.